The company M.A.S. is a Polish company manufacturing and engineering refrigeration industry and the recovery of energy (electricity, heat, cooling) with headquarters in Starachowice. We specialize in designing and manufacturing energy efficient equipment and refrigeration systems and energy recovery. Production equipment is based on their own original technical solutions and design. We also refrigeration systems, energy recovery and the launch of our machines and systems and provide maintenance services. We also specialize in heat recovery and energy production equipment, industrial processes and municipal waste and the use of them for reuse as electricity, heat or cooling. 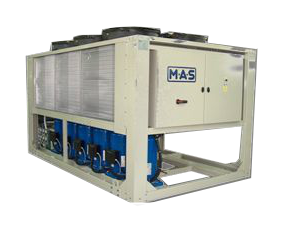 We produce air-cooled condensing units, chillers cooled by air or water, and water coolers. We are the manufacturer of compressor units based on reciprocating compressors. We perform warranty and post-warranty service, repair and maintenance. We deal with constant supervision and maintenance, which allows long-term and reliable operation of the equipment and the cooling system. We specialize in the design, development and manufacture of equipment and complete cooling systems and energy recovery (electricity, heat, cooling). M.A.S. Sp. o.o. is liderującym provider in the country and in Europe. In order to carry out further projects we are looking for employees who will join our team. Looking for an interesting job with opportunities to develop your career? Join us.